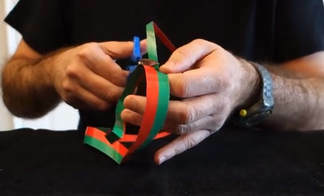 ​For this trick a simple loop of paper is cut with scissors along its length, but instead of producing two half-width loops of the same diameter as you would expect, you make a single loop- half as wide and twice as long! Cutting other loops leads to even stranger results, like loops that are interlocked and different sizes. What could be happening?